In April, Bloomberg was eager and quick to associate slow Q1 growth in Samsung's OLED unit to an imagined problem of "weak" sales of Apple's iPhone X. That was clearly not true. Writing for Bloomberg, Mark Gurman carefully avoided any mention of the fact that Samsung itself had reported that its Display Panel sales were facing intense competition from other suppliers of commodity rigid OLED and conventional LCD screens. Samsung actually stated at the time that "demand for flexible panels remains strong in the high-end segment," a clear reference to Apple, the world's largest supplier of a high-end phone featuring a flexible OLED panel. Across Q2, Samsung's revenues from its "Device Solutions" unit that builds Semiconductor components and Display Panels were up by 25 percent, while its sales of finished goods were down. Its "Internet and Mobile" group performed the worst, with IM Mobile sales (including Galaxy phones, tablets, and PCs) turning in a 22 percent revenue decline that dragged down the performance of the entire company. 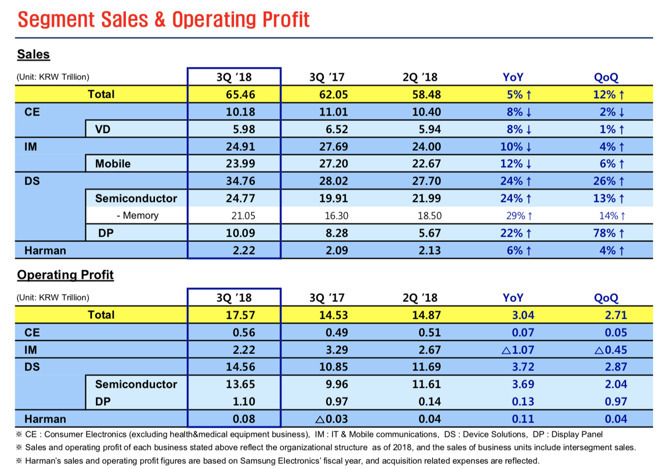 In the most recent Q3, Samsung again turned in solid 24 percent growth in component sales, specifically noting "growing [OLED] sales led primarily by increasing demand for flexible panels," that resulted in "solid earnings on the back of [OLED] demand from major customers." Suddenly, the OLED supplier's association with iPhones vanished. While Samsung's component sales performed well, finished good sales from one of its largest component customers did not. Samsung's own IM Mobile unit turned in another 12 percent decline in YoY sales, and profits from IM Mobile declined by more than 32 percent. That leaves one other "major customer" responsible for selling that many of Samsung's flexible OLEDs —Apple. Smartphone estimates for Q3 from Gartner indicate that Samsung's sales fell by 14 percent YoY, by far the worst performance across the top five smartphone makers. It was "the largest year-over-year decline since Gartner began tracking smartphone sales globally." Apple's iPhone sales remained flat YoY, but its product mix shifted from sales of one OLED phone with the launch of two new iPhone XS flagships. If demand were weak for Apple's new high-end OLED iPhones, surely it would be evident in Samsung's OLED sales—the most expensive component of the new models—rather than just a few minor component suppliers who get most of their business elsewhere—including Samsung's poorly performing IM Mobile group suffering from a chronic, devastating decline in sales that's persisted across 2018. The world's other leading phone makers, Huawei, Xiaomi, and Oppo, get most of their display panels from other suppliers, including BOE and LG. Apple is also reportedly sourcing OLED panels from LG as an alternative to Samsung beginning this quarter. 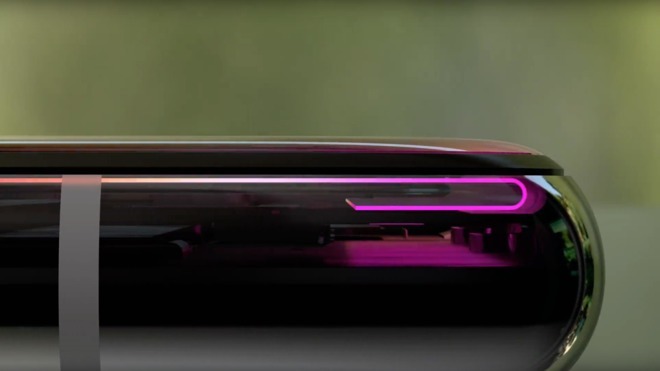 Further, sales of iPhone XR, Apple's first Face ID model to not use an OLED panel, began at the very end of October. 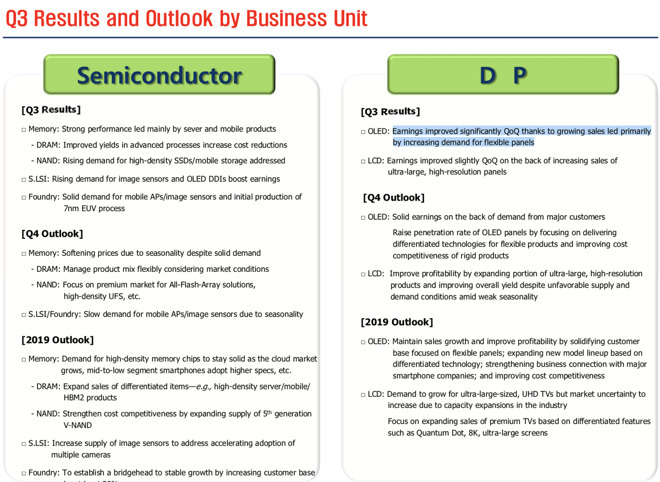 That means the business holding up Samsung's OLED growth is likely to begin slipping over the next year. But right now, Samsung's component business is outpacing the growth of the rest of the company while its smartphone-centric IM Mobile group is dragging. The only explanation is that it continues to benefit from a solid customer with strong sales, and Apple is by far the primary driver of the high-end, flexible OLED panels that Samsung credits for its component sales success.